Perennial herb from a rhizome; stems solitary, sometimes branched above, 5-35 cm tall. Basal leaves smaller than the stem leaves, often deciduous by flowering time; stem leaves 3-4 (rarely 5-6) pairs, often all produced near the basal ones, lanceolate to oblanceolate or elliptic, 1.5-14.5 cm long, 0.5-2.5 cm wide, reduced above, glabrous to hairy below, hairy above, unstalked or stalked below, unstalked above, entire to toothed. 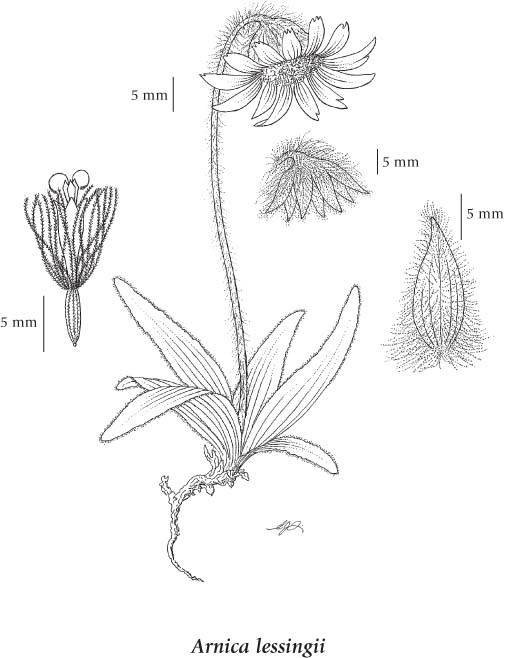 Heads with ray and disk flowers, solitary, usually nodding, the bases moderately long-hairy with brown hairs; involucres 12-17 mm tall; involucral bracts lanceolate to elliptic, long-hairy, the tips fringed; ray flowers yellow, 8-14, conspicuously toothed; disk flowers yellow, anthers purple, conspicuous. Achenes 5.0-6.5 mm long, sparsely short-hairy to glabrous; pappus brownish, finely-barbed to more or less feathery. Moist snowbed sites, streambanks and meadows in the alpine zone; infrequent in N BC; amphiberingian, N to AK, YT and NT, E Asia.